I'm one of those "I'm not happy unless I'm incredibly busy" people. Add to that an extremely active mind, even at night and bouts of anxiety. Yay! I'm working on so many projects right now - all of which I'm so excited I can barely sleep. That fact is starting to affect my health. So that I'm not a walking stress ball, I've changed my diet pretty dramatically (focusing on plant based food and eliminated quite a bit including all meat but fish), have gotten myself back into the pool and with the help of a new app called Refresh, this talented and handsome fellow recently came to my apartment- massage table in tow to "refresh" my mind and bod. 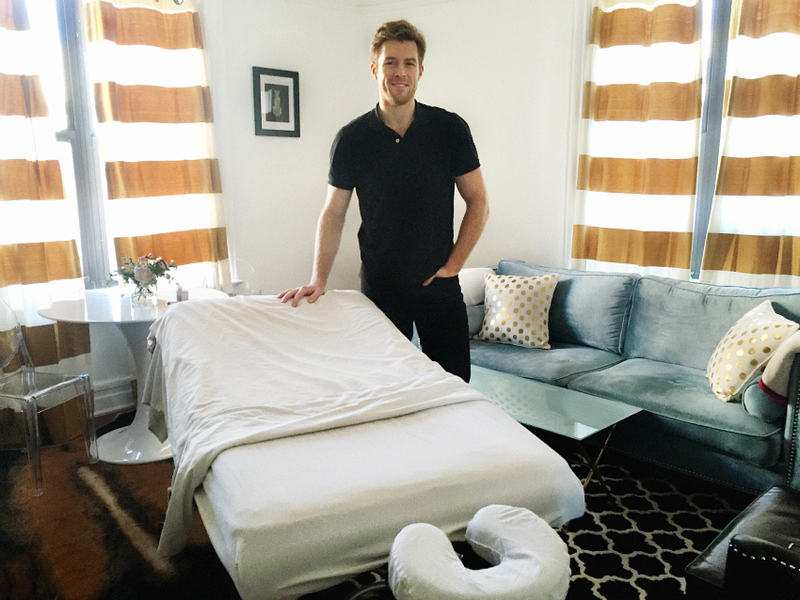 Jonathan is one of the many massage therapists at Refresh Body. The app is ridiculously easy to use and offers "world class wellness wherever you are". You can book massage, pilates, yoga or mindfulness (I want to try this next!) I think booking took all of a 2 minutes if that. I selected a 90 minute Swedish massage but you can also do Thai, Deep Tissue or Sports massages. You can even choose who you'd like to come - pick Jonathan, reasons...obvious. The masseuse shows up to your place, sets up the table (we used my living room pictured above), Jonathan put on some really chill jazz and left the room for me to get on the table. Then for about 90 minutes transformed my life, haha. I've had a lot of massages, a lot! and this was one on par with the best. The awesome part is that when it was over - though I kind of wanted to have a tantrum and get 90 more minutes, it was nice that I was already home and not sent out into the streets of Manhattan to become stressed 10 minutes after my treatment. I could take the time to be still and continue to quiet my mind. I did have to run out shortly after for a meeting in midtown but I was incredibly relaxed for the rest of the day and it set me up for feeling amazing the rest of this week. Next time I think I'll book the latest appointment and go right to bed. Heaven! Services provided by Refresh Body, all opinions are my own.